There was so much orange, gummy residue in this S-C Silent-Super that I got from Ebay a couple weeks ago. I think it was old WD-40. 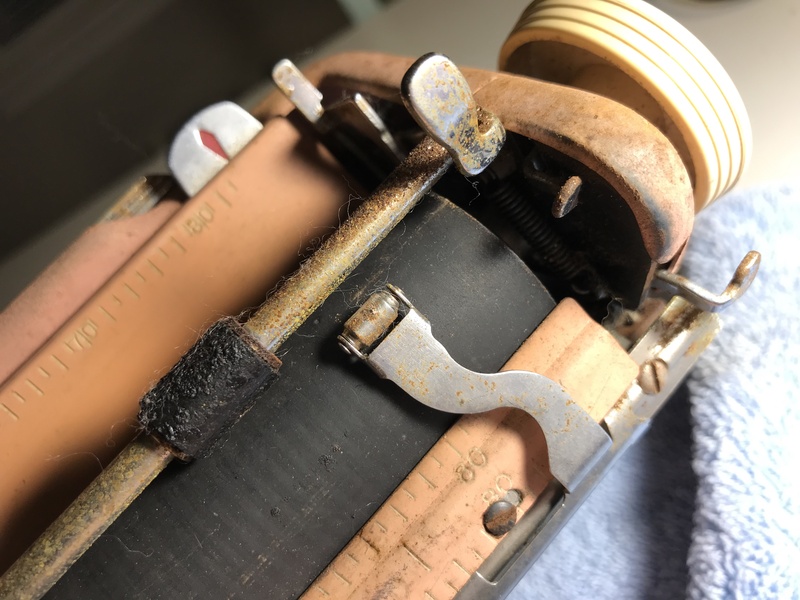 The escapement (and carriage rails, margins, shift lock, space bar) responded to a good cleaning with mineral spirits, but the typebars required a lot of work. I searched my mind, but I don’t think I have ever come across as sticky a typewriter as this one. The typebars were gummy not only in the segment but at many other tight pivot points. Some keys were sticking in the sublever segment, and some were gummy at the clevis connections. Others (I think) were sticking in the key guide comb. I also had a couple type slugs that had little corrosion burrs that caused them to stick in the typebar guide. I cleaned up the sides of the affected type slugs with some steel wool. The mineral spirits I buy in Virginia seems to be a more aggressive formulation than the gentle, forgiving mineral spirits I get in California. I have to be very careful to keep these Virginia mineral spirits away from any painted surface. After de-gumming the mechanics, I removed the Silent-Super’s tangled drawstring from its guts. I made the new drawstring from heavy duty waxed thread. I didn’t have the little hook end for the drawstring, so I just made a knotted loop and tightened it down at the anchor point at the right end of the carriage. I used the Robert Messenger method of drawstring attachment and pre-wound my mainspring before I attached my drawstring to the mainspring. 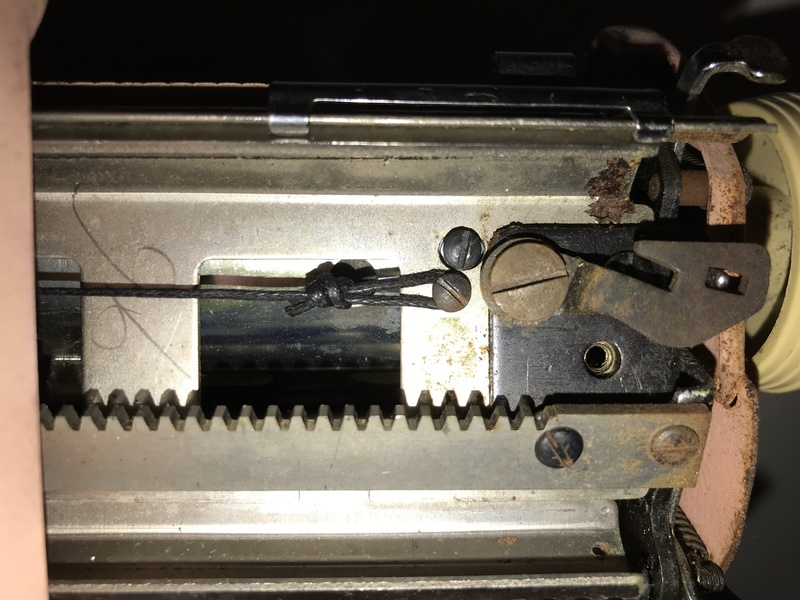 However, I just saw a very interesting Phoenix Typewriter video that demonstrates a Smith-Corona mechanism that allows you to wind the mainspring after you attach the drawstring. You learn something new every day ! The tabbing mechanism was still halting and sluggish. I wiped down all the pivots points I could see, but it was still slow on tabbing. 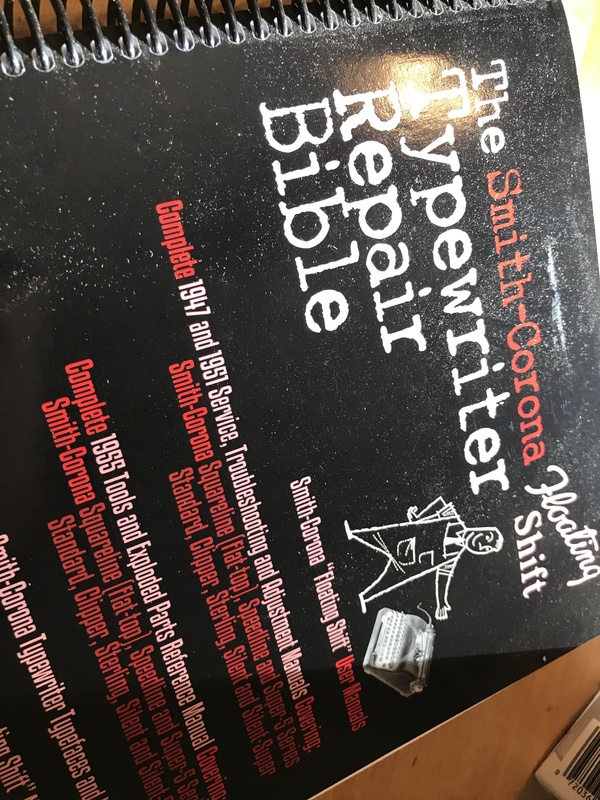 Fortunately I had Ted Munk’s Smith-Corona Floating Shift Typewriter Repair Bible. This repair manual is also available as a PDF download. After reading through the section on the tabulator, I found the buried spots I had neglected to clean with mineral spirits. After a good clean, tabbing was fast and smooth. This service manual is also available in PDF format. I like the hard-copy books that I can paw through with my grimy hands. The uppercase/lowercase alignment was a little off. The lowercase letters were printing a wee bit high. 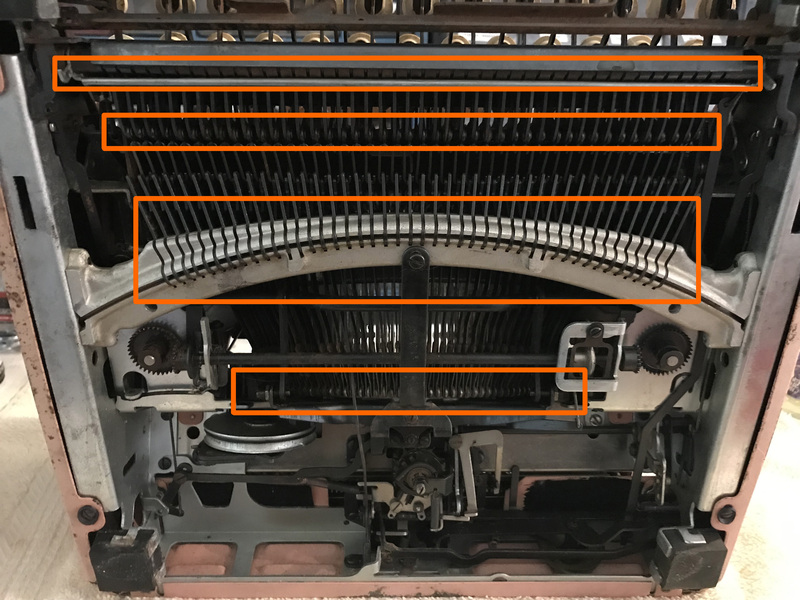 I referred to Ted Munk’s post about making vertical alignment adjustments on segment shift typewriters. Phoenix Typewriter also has a very good Youtube video on making the adjustments. I used a 3/16″ nut driver to loosen the lowercase lock nut and turned the adjustment screw a bit with a teeny screwdriver. Whoops! Wrong way! It’s going up higher. Other way, other way. That’s better. I tightened down the lowercase lock nut and it’s all good. I removed the platen to clean it and all the bits around it which were still very sticky and furry from congealed something-or-the-other. 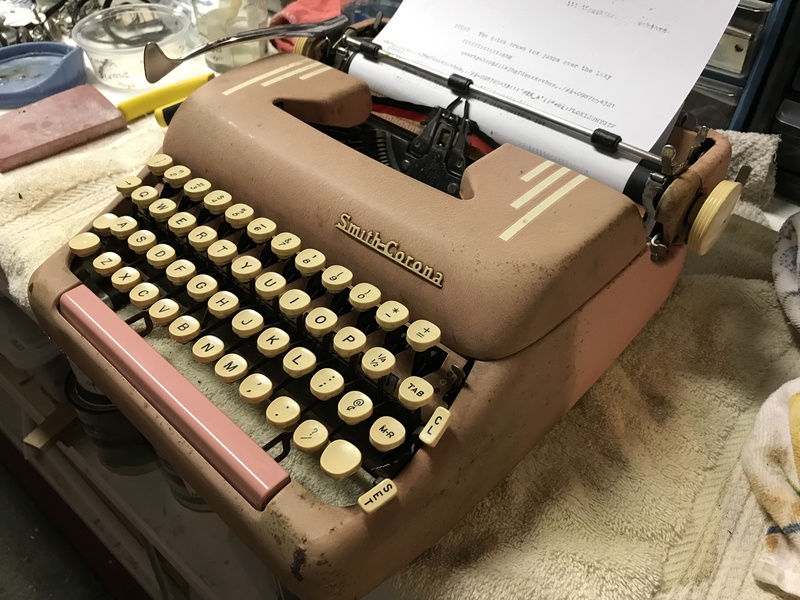 Removing the platen is pretty easy on this type of Smith-Corona portable. Joe Van Cleave has a good Youtube video describing the features of a S-C Silent. At about 11:30 in the video, he demonstrates how to pop out the platen. I cleaned the gummy residue from the platen, rubber bail rollers and feed rollers with denatured alcohol. Pinkie’s outer skin was still pretty rough. She had lots of surface rust and bare metal. I used diluted Scrubbing Bubbles to gently clean the pink paint. I was worried that it would remove paint, so I tested in an unseen spot in the back. It removed gray grunge but no pink paint. Here’s a photo on my work bench after I had cleaned her backside. The machine arrived from Ebay with a gray, grubby cast, but a careful cleaning slowly revealed her bright pink flesh. Pinkie’s pink paint was very bright, but she had some major dings. I primed bare metal spots, and I made up an acrylic paint mixture of various pinks for paint touch-up. 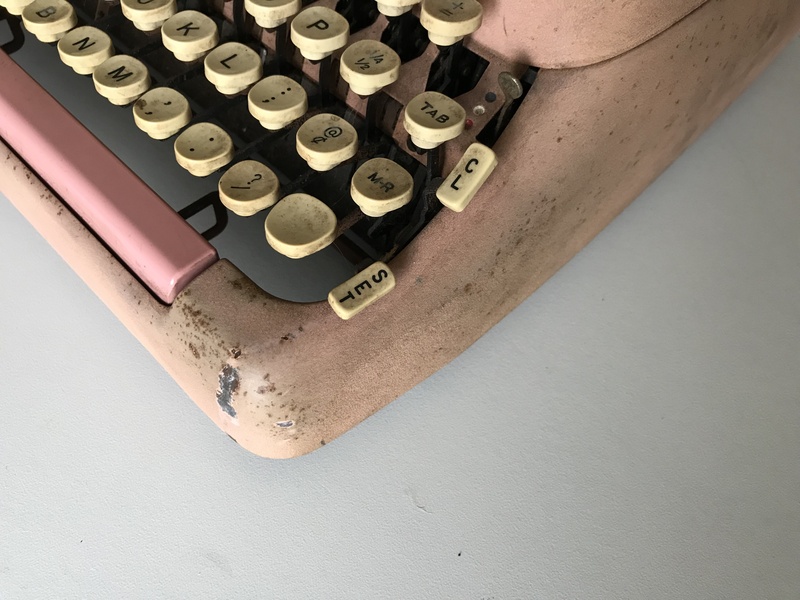 It was tricky because the pink was not uniform in color over the typewriter: salmon here, coral there, dusty rose over there. Old Pinkie has lost a lot of her grungy, corrupt toy vibe. However, I “kept it real” with this clean-up, so she still has her charming smattering of corroded freckles. X Over It has a nice collection of Smith-Corona portable advertisements. Pinkie’s color is officially called “Coral Pink”. In 1957, Silent-Supers’ list price was $129.00. If you convert that to 2019 dollars, that’s about $1160.00. That sounds like a lot, but I know that I spent more on computers in the early 1990s that are now considered e-waste. Hello, 386/33 with a whole 4Mb of RAM! Pinkie gets along great with her blue S-C Sans-A-Tab brother. 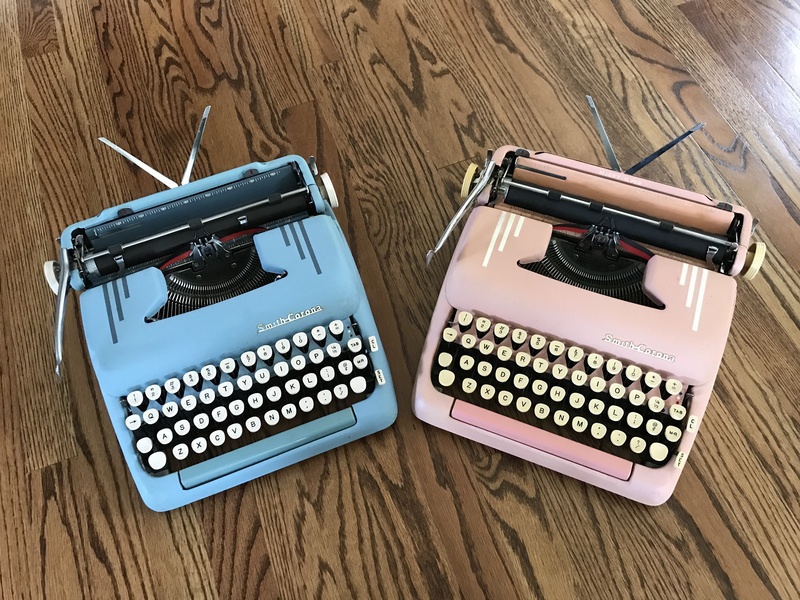 Maybe I can rent out my pink and blue Silent-Supers to people throwing gender reveal parties. Typewriters seem safer than involving alligators. I have a pretty collection of colorful Easter eggs sunning themselves on the bookshelf. Another entertaining and informative post—well referenced and well narrated. Always a pleasure to read, and Pinkie looks fantastic! 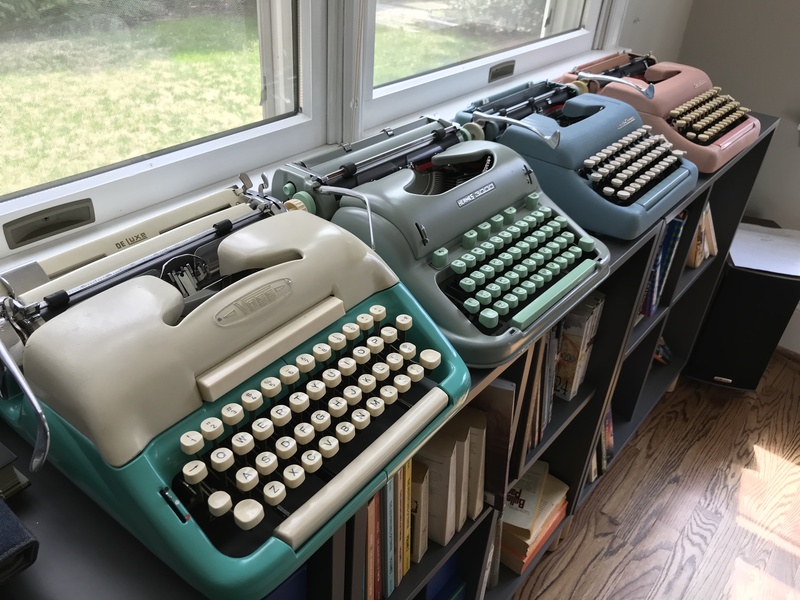 Thank you – these very dirty typewriters are my special favorites. Congratulations! That is a fine job on Pinkie. There are 2 enemies of a typewriter: WD-40 and key choppers. 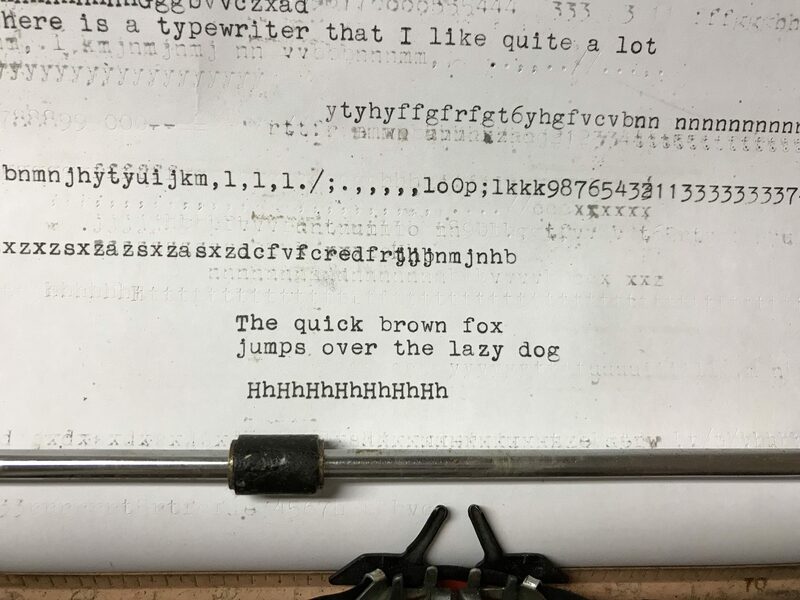 I am going to add another enemy to typewriters: wet basements. Seeing the pictures of the machine partly cleaned made me think how in the restoration of the Sistine Chapel they deliberately left certain patches untouched, to show how dingy the frescoes were pre-restoration. Nice work by you! Pinkie is a work of art – mid-century industrial art. I am so glad I subscribed to this! Love reading your posts. Pinkie looks marvellous. I have the same baby-blue Super as you. Now I need a pink one. You are awesome. And thank you. Pinkie was supposed to be a fun “catch and release” project…but I got a little attached and I think I need this pink one. Fantastic blog post, as usual. The hard part to me is the paint touch-up. 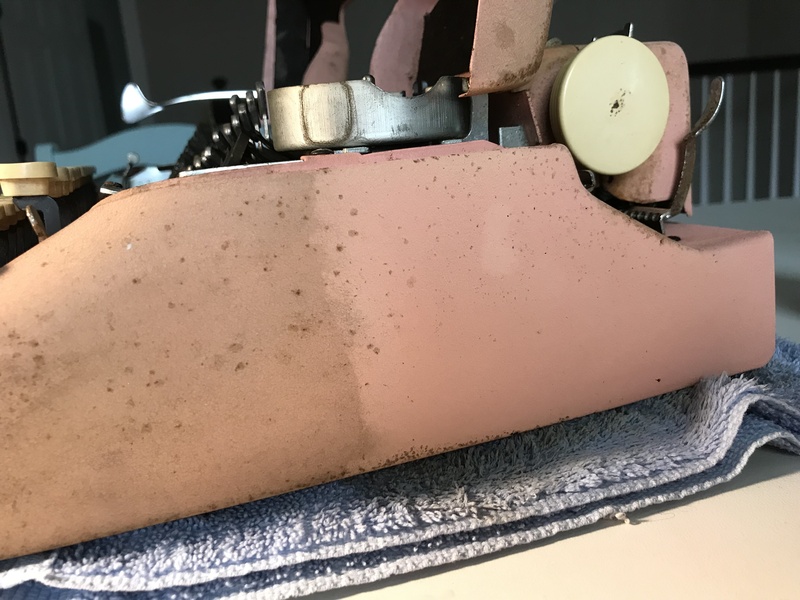 The paint touch-ups required some experimenting, especially since the color was different in different areas of the typewriter. I would mix up the pink, test, add a bit of yellow or blue or black, test again, etc. Well done, she’s a beauty. Thanks, Joe. Your video on the S-C Silent was really helpful when I needed to remove the platen. I have been diving into your Youtube video archive recently – they are very entertaining. 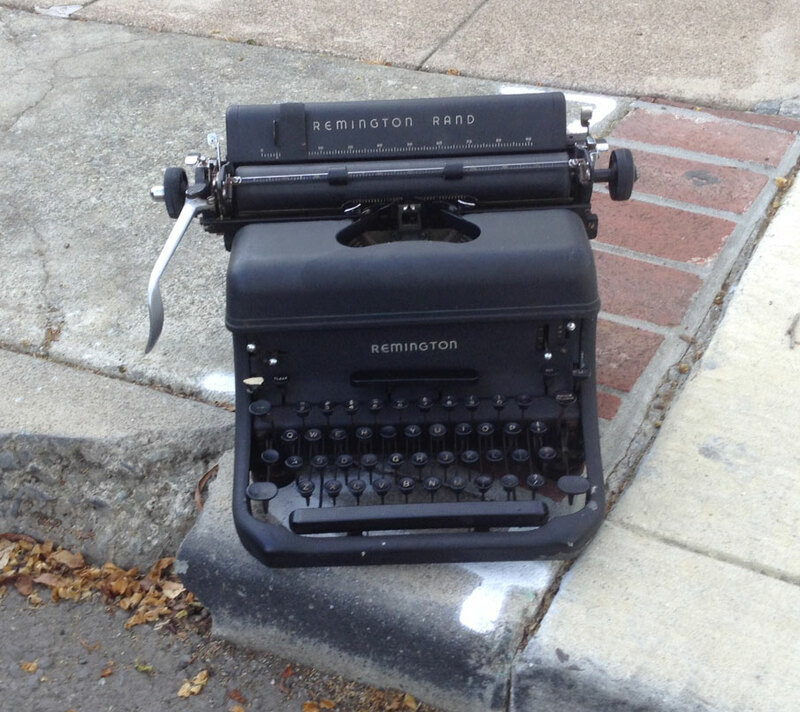 These typewriters feel like comfortable old friends – familiar, solid, forgiving, and durable. I wish I had a supply pipeline of distressed S-C portables to work on. 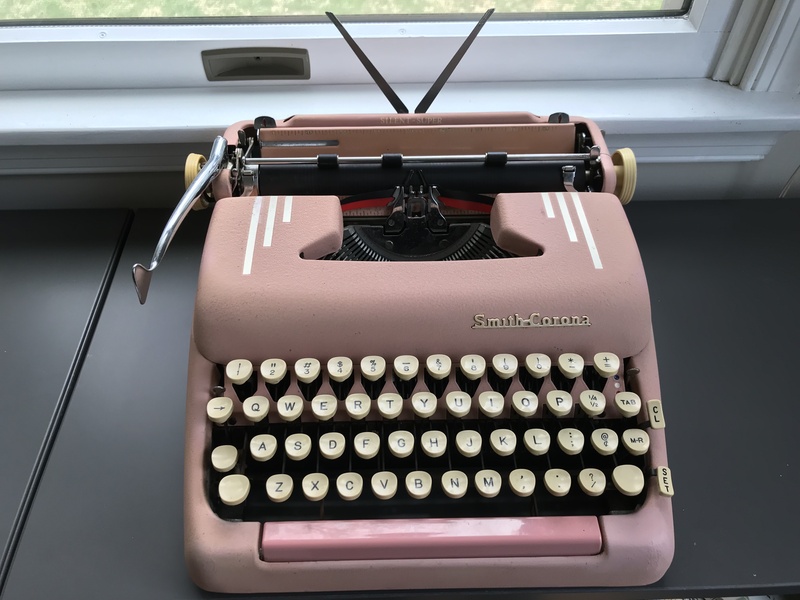 I have a weakness for pastel 1950s portables – especially Smith-Corona 5-series. They are impressively durable. They can look terrible but still type. I enjoy working on them also because they are compact and small enough for me to handle easily. And the mechanics are very accessible. And there’s excellent service documentation out there for them. I could go on and on. And I love typing on them. I am a middle-aged mother of two whose 12 year-old dragged home a broken typewriter. We fixed it. It was fun. It is fun. Now we have ten or twelve. 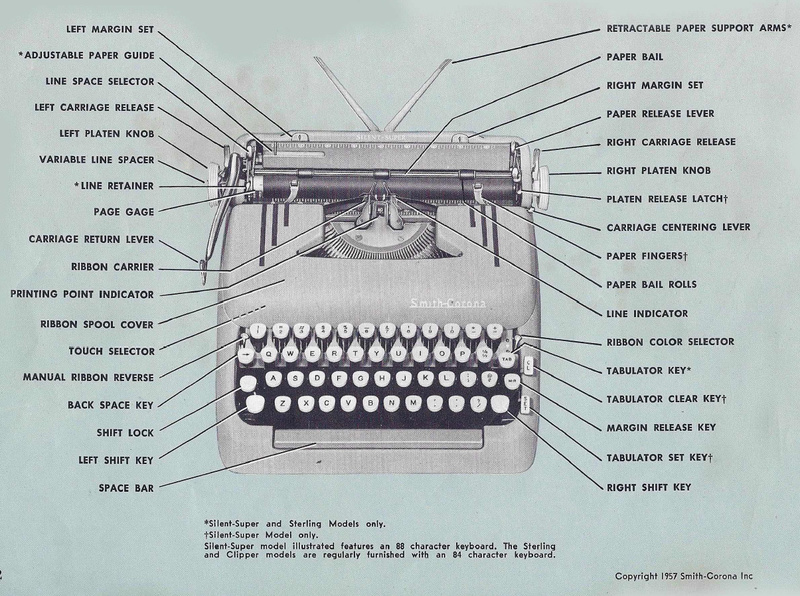 We love our manual typewriters.